Each of the 55 examples has been recorded three times: 1. The left and right hand parts are played through twice with drums & percussion, guitars and keyboards at the regular tempo. 2. 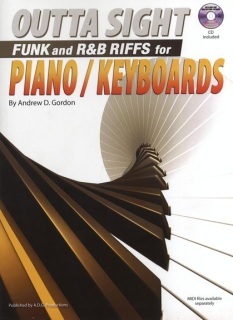 Rhythm tracks at the regular tempo of guitar, bass, drums & percussion to practice the keyboard parts along with. 3. Slowed down track of the left & right keyboard parts with the drums so that you can precisely hear what the keyboard parts are playing.